"There is no way to adequately reproduce the beauty in a child’s face or the wonder of nature. But I feel very fortunate to be able to create a close approximation. I am truly humbled by what happens to a sunbeam as it filters through the cracks in the barn siding and illuminates the interior. I wish I could exactly reproduce that beauty but I have to be satisfied to come close, and keep trying. It pleases me when my paintings make people happy. When my painting causes you to remember a special person or place or time I feel very privileged. I hope that you will continue to be pleased by my efforts. You are my inspiration." Jean Gauld-Jaeger received training in Decorative Art in Pittsburgh, Pennsylvania. She exhibited her Decorative Art pieces in art shows in the Chicago, Illinois area from 1963 to 1969,during which time she also taught Decorative Art classes there, and afterwards, in Birmingham, Alabama until 1978. Following her academic studies at the University of Alabama in Birmingham (BS in Social Work) and the University of Cincinnati (MS in Health Planning and Administration, Mrs. Gauld-Jaeger began a long professional career at Vanderbilt University Medical Center as Director of the Department of Patient Affairs from 1978 to 2003. Near the end of her professional employment, Mrs Gauld-Jaeger began studying fine art with well respected portrait artists Michael Shane Neal, Roger Brown, Jason Saunders, Dawn Whitelaw and many others. 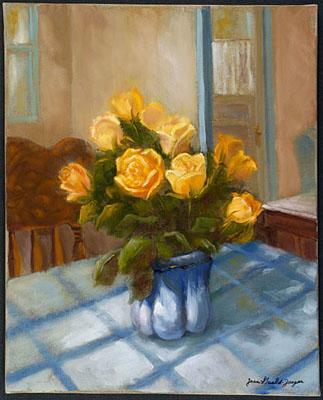 She continues to teach group painting classes and workshops in both her studio and other locations and has students studying with her on an ongoing basis. 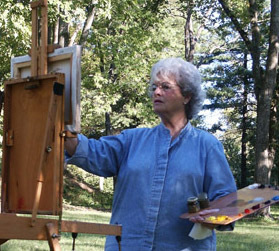 Mrs. Gauld-Jaeger is a past president of The Chestnut Group, an important group of Middle-Tennessee artists who capture the beauty of the Tennessee landscape in their artwork and raise funds to protect significant historical and natural sites in Tennessee; a member of The Portrait Society of America, The Nashville Artists Guild and the Oil Painters of America; and Gallery Chairperson and Vice President of the Tennessee Art League. 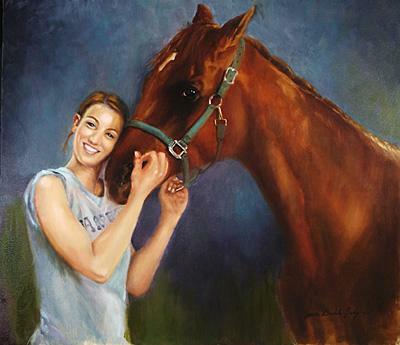 A Recipient of numerous awards for her portraits and landscapes, her oil paintings may be seen in the Tennessee Art Legue galleries, Midtown Gallery and Framers in Nashville, LeQuire and Company Gallery in Green Hills, Nashville, Imagine Gallery at The Factory in Frankllin, and The Retreat in Brentwood. "I could hardly believe my own eyes when the children began to emerge from the canvas. This was my first attempt to paint people. I was very comfortable with apples and pears but I never even tried painting people. My son said, Mom, you need to start painting again.’ He bought some paints and brushes for me and, so as not to hurt his feelings, I tried to paint from a photo of my grandchildren. Not expecting much, I was shocked when they not only looked like children, but looked like those particular children. I decided I had better get some instruction. Fortunately I was able to get into a workshop with Michael Shane Neal, one of this country’s best portrait artists. With his instruction and encouragement I learned to capture the personality of my subjects. That was ten years ago and I still feel a thrill when the person begins to emerge from the canvas." "Have you ever been struck by a moment of exquisite beauty, a moment that stops you in your tracks and causes you to say, Ohhh....thank you, God!’ And has that moment stayed with you and enriched your life? These are the moments and scenes that cry out to be captured on canvas. And whenever you look at them they bring a smile to your memory." Painting outside with friends is the most enriching experience an artist can have. Whether it’s a cold drink after a day in the hot sun, or laughing at the floppy straw hat and ear muffs on my friend on a bitterly cold day, or laughing as my husband swats at flies that continue to interrupt his leisurely reading, I will always cherish these times. Pleinair painting has helped me to see better and paint faster. The sun won’t wait for me to get that shadow just right. As long as I can drag my arthritic body out there, I will continue to paint in pleinair’." "There are places in our minds that call forth a scene. It may be a moment during childhood when you felt totally cherished by someone and it made you light up inside. And every time you see that scene, or one similar, you feel that love again. For me it was lying with my head on my grandmothers’ lap and all was right with my world. Every time the light falls across the Victorian loveseat in a certain way I relive that moment. Fresh eggs in a basket on the table or a vase of yellow roses make me remember warm summers and a visit to the farmers market. We are blessed to be able to return to those places in our memory."